Harry Smith liked to look for keys to the universal patterns that shape our cultures and the hidden realms of the human unconscious. He compared patterns in native American music with the eccentric rhythms of jazz; the patterns in Seminole patchwork with those on Ukrainian Easter eggs; the intricate diagrams of master occultists with the ambient rhythms of the sounds of New York street life—and somehow assembled from these a harmonic web of cosmographic ideas, employing all the investigative rigor of his early anthropological training. His work explored many mediums, from music to film to painting to collecting, and his collections of peculiar impedimentia—seemingly unrelated objects threaded with meaning—expanded to fill his small New York hotel rooms. 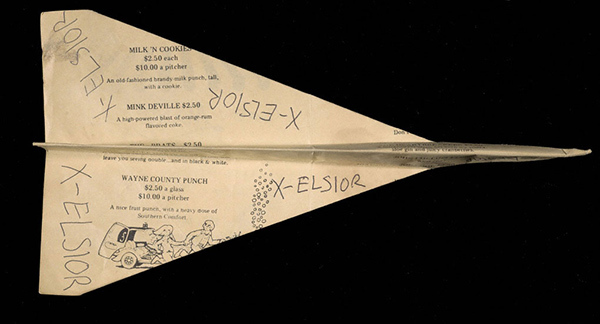 One of the groups of objects Harry Smith assembled, as Nancy Perloff noted in her piece on Smith’s archives earlier this year, was a collection of over 250 paper airplanes found from 1961 through 1987 on the streets and sidewalks of Manhattan. Harry would pick up these transient paper objects, otherwise doomed to be swept away or decayed in the weather, and find meaning, value and purpose in them. He tagged each with the time and location of their finding, acting as a meticulous field worker, freezing the moment of a stranger’s whim for later inspection and evaluation. These wound up squirreled away amidst his other collections, rarely seen by others, but enlarged by his telling into the World’s Largest Paper Airplane Collection. 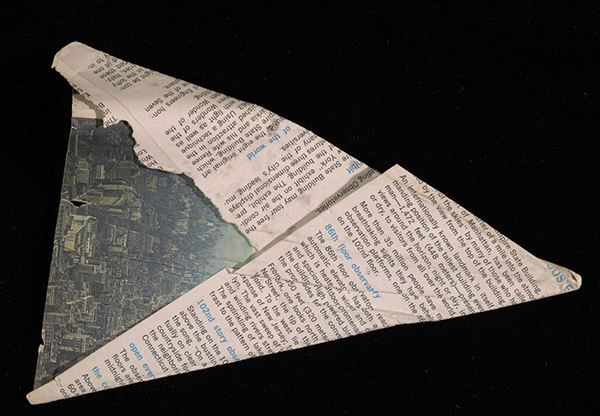 Folded from the ephemera of the times, these airplanes not only preserve clues describing their culture, but are also enigmatic reminders of the changing whims and passions of the human heart in an ever-changing world. They tell a story of countercultures within a commercial world, a story of the arts, a story of ordinary people going about their extraordinary lives. 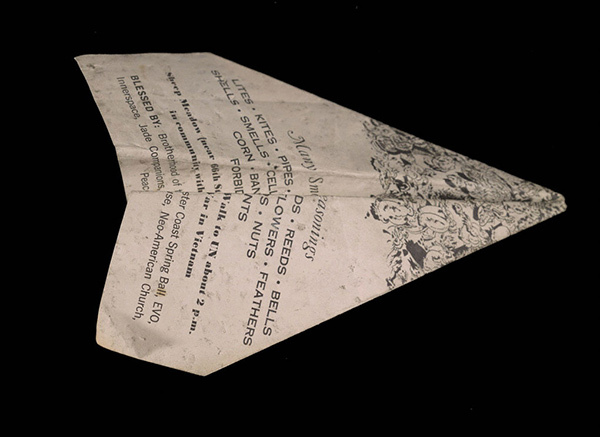 The earliest example was folded from a card advertising a Betty Crocker cookbook in 1961. The 1967 examples include a flier for a counterculture event labeled “MANY SMOKES AND SPRING SEASONINGS,” a flier asking the disaffected to “DEMONSTRATE AGAINST THE WAR,” an example hand-inscribed as the “FLYING TITANIC,” an announcement for a lecture by Paolo Soleri, and an intricate piece of psychedelic art. It’s the turbulent Summer of Love in a nutshell. 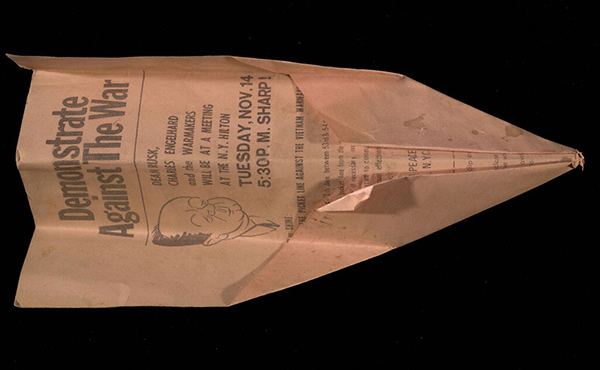 From 1968, we find a receipt for the purchase of a mink coat, as well as a flier describing the view from the Empire State Building, evidently launched from the top of the iconic building. From 1976 we have a Sisterhood newsletter, and a program for a play by Paddy Chayefsky. Over 250 of these creations have been preserved. 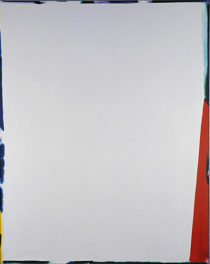 One of the most poignant is a connect-the-dots worksheet, printed on fragile, acidic paper, depicting a child gazing up into the air and declaring, “Oh! how I wish I could fly, There’s so much to see from the sky.” As long as that piece of folded paper endures, that child’s wistful longing will continue to be expressed, seemingly unaware that in May 1982, his wish was fulfilled. Access the newly completed finding aid for the Harry Smith papers here. 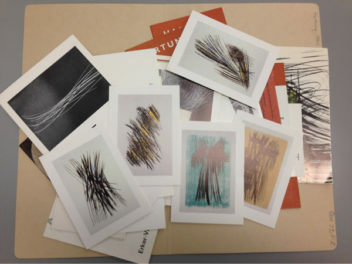 I'm a library assistant for special collections at the Getty Research Institute, and also write and illustrate semi-professionally. Some of my fiction will soon be published by the Conlan Press.